NUCLEO-L432KC - The STM32 Nucleo-32 board provides an affordable and flexible way for users to try out new concepts and build prototypes with the STM32 microcontroller, choosing from the various combinations of performance, power consumption and features.The Arduino nano connectivity makes it easy to expand the functionality of the STM32 Nucleo open development platform with a choice of specialized shields.The STM32 Nucleo-32 board does not require any separate probe as it integrates the ST-LINK/V2-1 debugger/programmer and it comes with the STM32 comprehensive software HAL library, together with various packaged software examples, as well as direct access to the ARM mbed on-line resources. 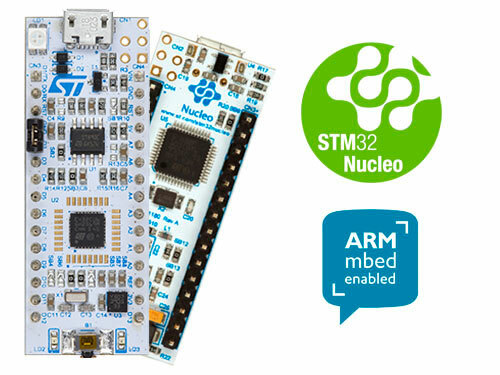 The STM32L432xx devices are the ultra-low-power microcontrollers based on the high-performance ARM Cortex-M4 32-bit RISC core operating at a frequency of up to 80 MHz. The Cortex-M4 core features a Floating point unit (FPU) single precision which supports all ARM single-precision data-processing instructions and data types. It also implements a full set of DSP instructions and a memory protection unit (MPU) which enhances application security. The STM32L432xx devices embed high-speed memories (Flash memory up to 256 Kbyte, 64 Kbyte of SRAM), a Quad SPI flash memories interface and an extensive range of enhanced I/Os and peripherals connected to two APB buses, two AHB buses and a 32-bit multi-AHB bus matrix.